Another beautiful post. Loving everything you do! May I ask were you got the candleholders? 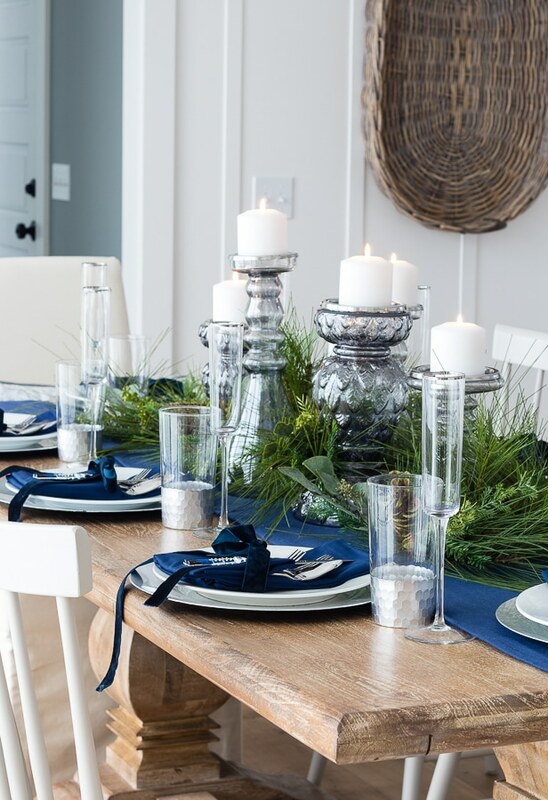 Hey Linda everything is linked right in the post :) just click on the bold words where I talk about the candle holders (I linked each one separately) and it will whisk you away to Hayneedle’s site where you can purchase them – thanks! You did an amazing job! It all looks beautiful! Thanks Miranda, it’s always fun to set a pretty table. Love this! It looks so pretty! Thanks so much Jamie, it was fun to put together! 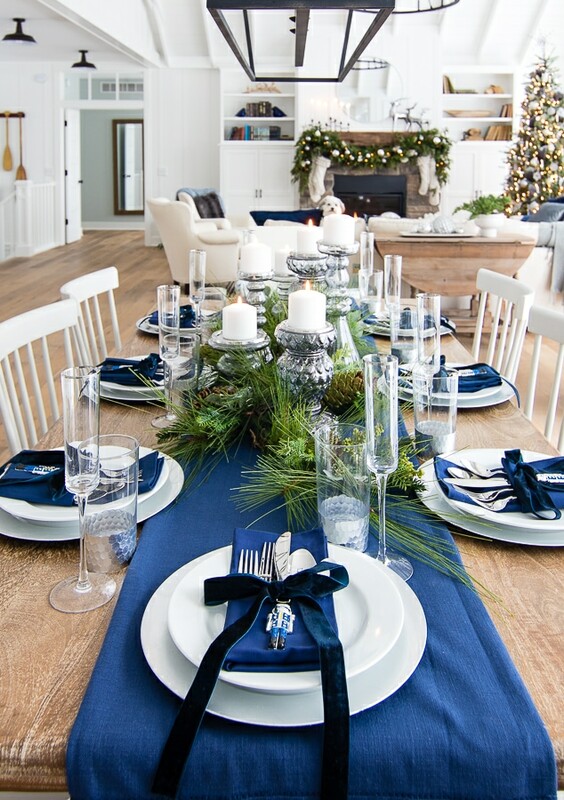 LOVE this table setting. 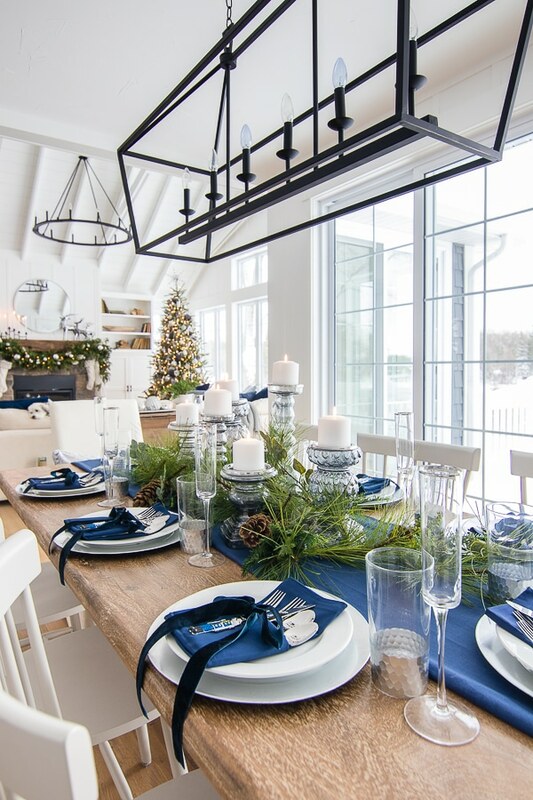 The candle holders, the metallic bottom glasses, the nutcracker accents- it all works so well together! So pretty- you did another amazing job! Thank you! 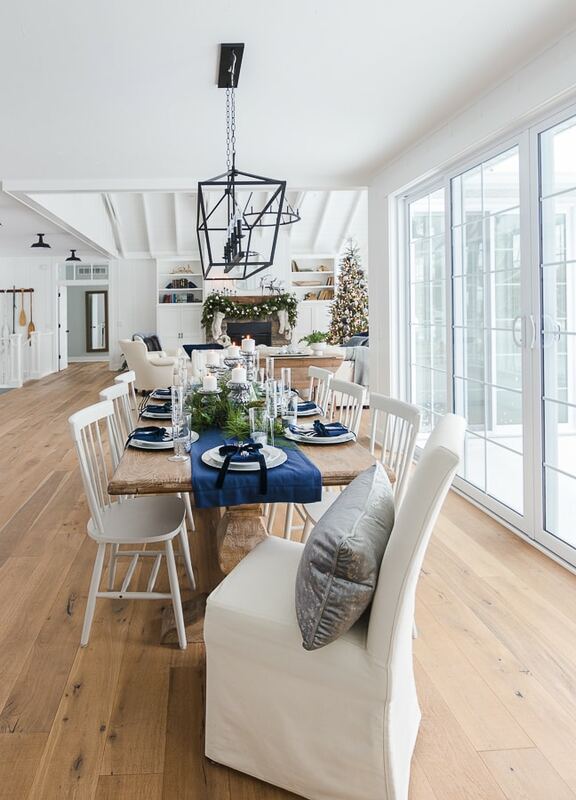 So excited to host Christmas this year with this pretty table! Absolute perfection. I love your home. Beautiful! I love the little touches like the nutcracker ornaments! Love your whole house! Aren’t they cute? Thanks Beth! 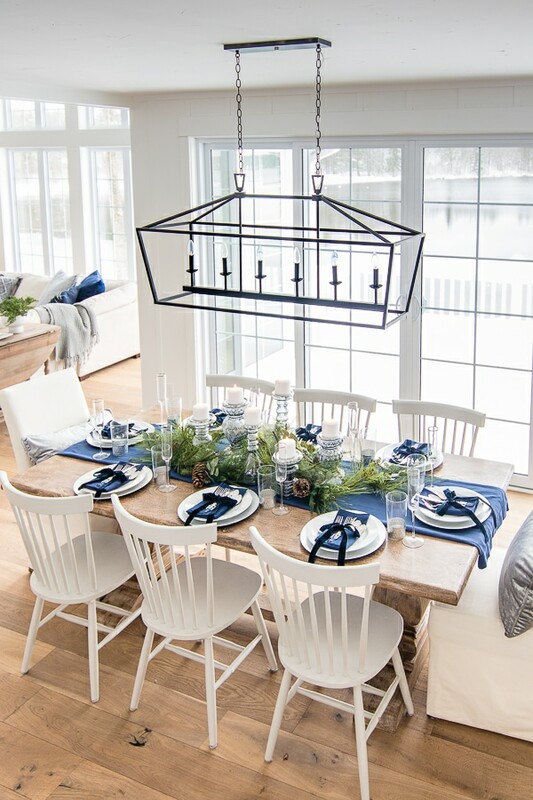 Kelly, your table is simply stunning! 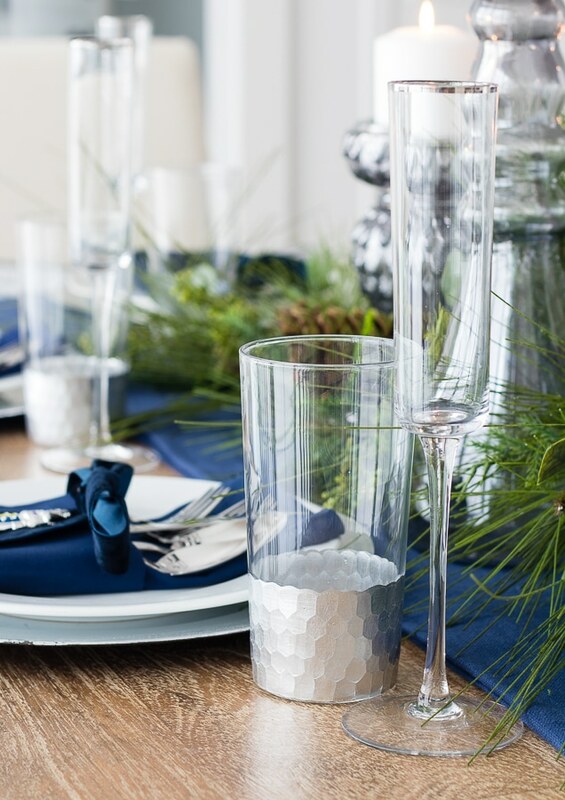 Love, love, love the navy and silver. And I MUST get those champagne flutes. 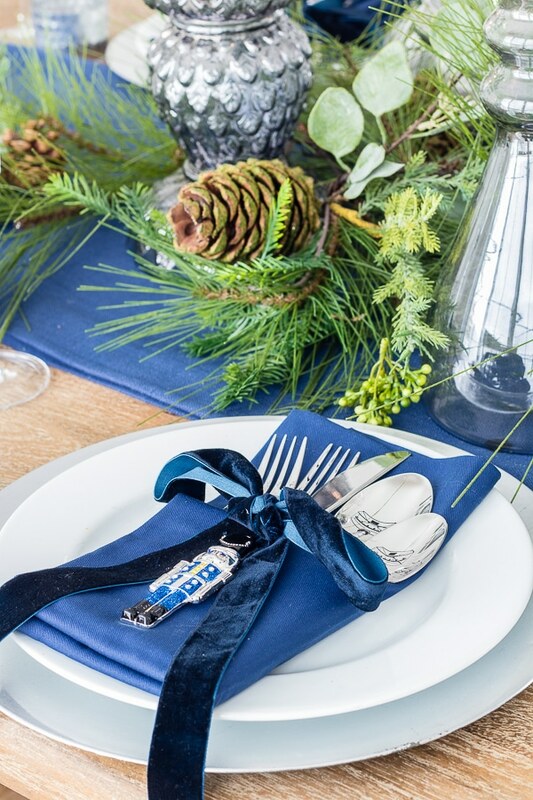 Will your naughty/nice tags from last year make an appearance on the kids’ table? Love your home!!! I’m also in love with navy blue😍 love all your posts! How did you hang your garland on the mantle and the wreaths with ribbon on the windows inside? The wreaths I used a suction cup type hook and the garland I used nails and floral wire! 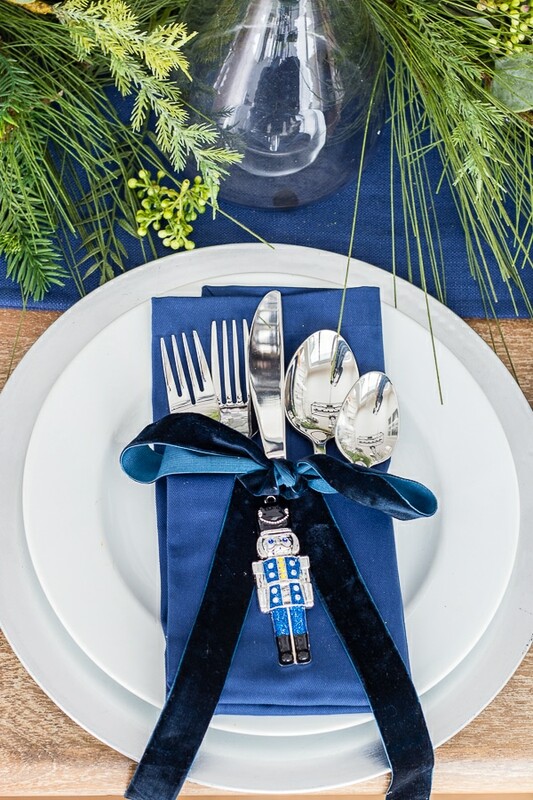 Beautiful table setting, elegant and understated. I have the same glasses, short and tall, but a different brand (i think) and I use them for a bit of elegance and sparkle too. I have decanters to match on my dry bar… I might have to add the flutes though, I have been looking for a set that I like. Merry Christmas! Oh fun, they are such pretty glasses! Looks absolutely GORGEOUS!!! And yes, please DO post your menu for the meals. I’m always looking for new ideas! Have a blessed day! It just hit the blog today Robbin – thanks! Thanks so much Marta, it’s so fun to decorate every year! I’m with Lynne! So fabulous! Merry Christmas everyone! So sorry I wanted to say your home is lovely, just love spell check most of the time. 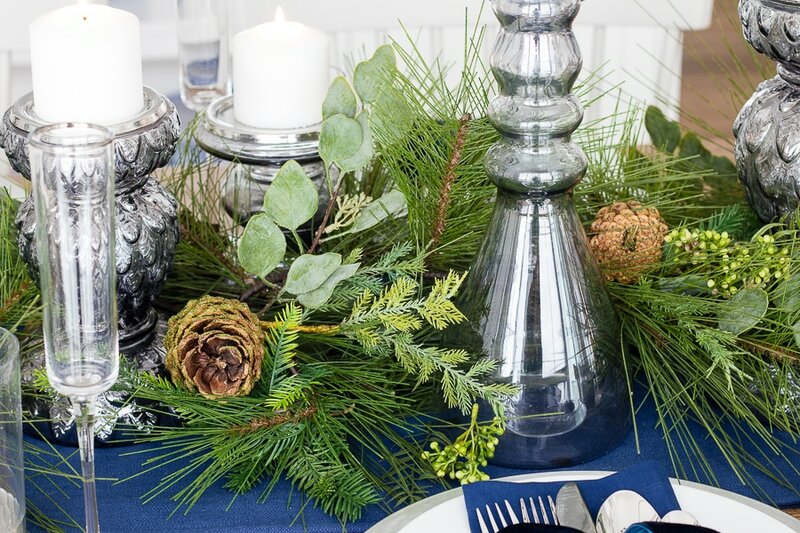 The way you incorporate blue and silver into your Christmas tablescape and décor looks wonderful. So beautiful! 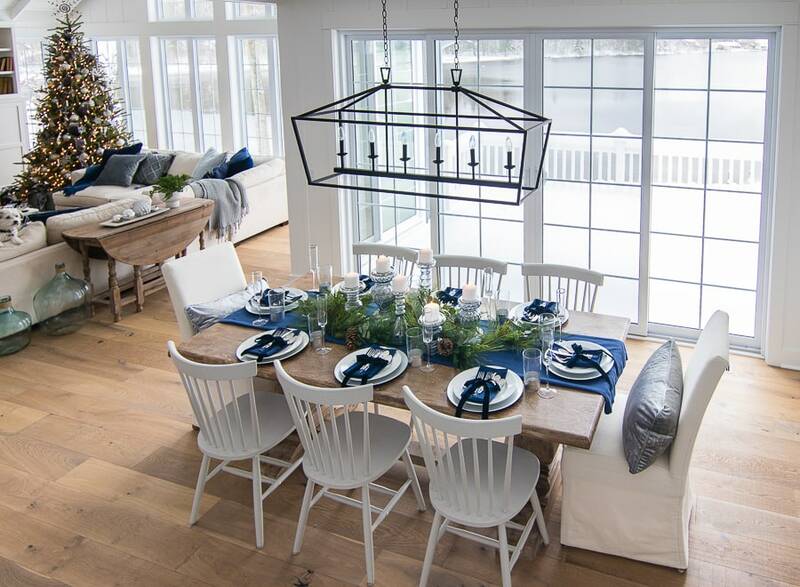 We just purchased a lake house here in Michigan and your blog has given me so much inspiration! Verna – I totally agree with you – it’s gorgeous. Ooooooooooh – how gorgeous. I love everything. And I love your home. I remember seeing the exterior awhile back when I was searching for exterior colors. We just painted our home using BJ Hale Navy; is that the color of your home. BTW, I just noticed we have the same exterior doors – don’t you love them? I just love everything about your home. I also noticed you are on a lake and since we just moved into our home and landscaping hasn’t started yet, would you mind sharing a side view of your house? As I look at the photo of your home from the back, it would be on the right-hand side. Our lot slopes down very similarly to your lot and I am just looking for ideas. Our landscaper says we probably don’t need a retaining wall, but I am a little skeptical of that. Again, perfection personified. Thank you for sharing your home with us. Our siding is by Mastic and the color is Natural Slate but I do love Hale Navy. Our house is quite a bit more grey than that. Unfortunately everything is covered in a foot of snow right now so I don’t have any landscaping photos to share! If you go to my home tour page there are some more outdoor shots – thanks! Hi, Kelly. I bet the snow is lovely. Thank you for your response. No need to take any photos with the weather like it is. I was just curious if you all had any type of retaining wall. Our landscaper said we didn’t need one, but it just seems so steep to me. Enjoy your holidays, and once again, your home is incredibly gorgeous. We have big boulders going down the side staggered to help with the grade as well as big stone steps. Hope that helps! I love everything! The silver and blue are just lovely. 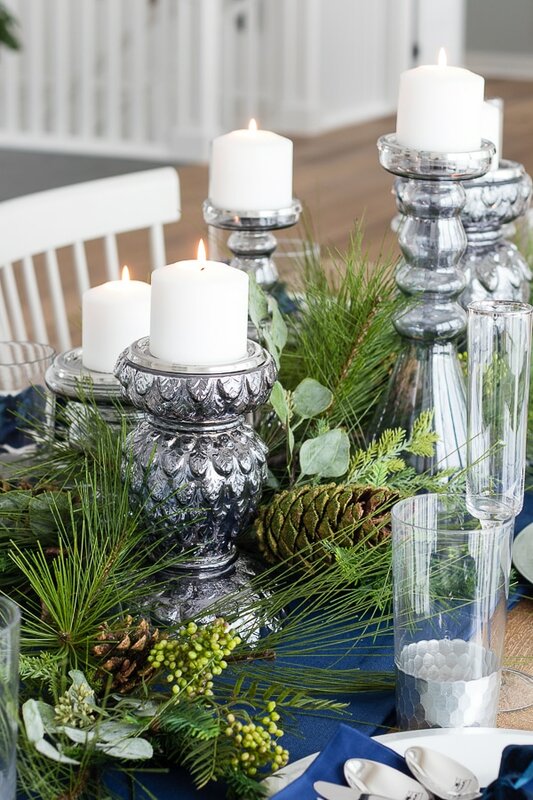 I have several mercury glass candlesticks and I am always looking for more to add to the table. 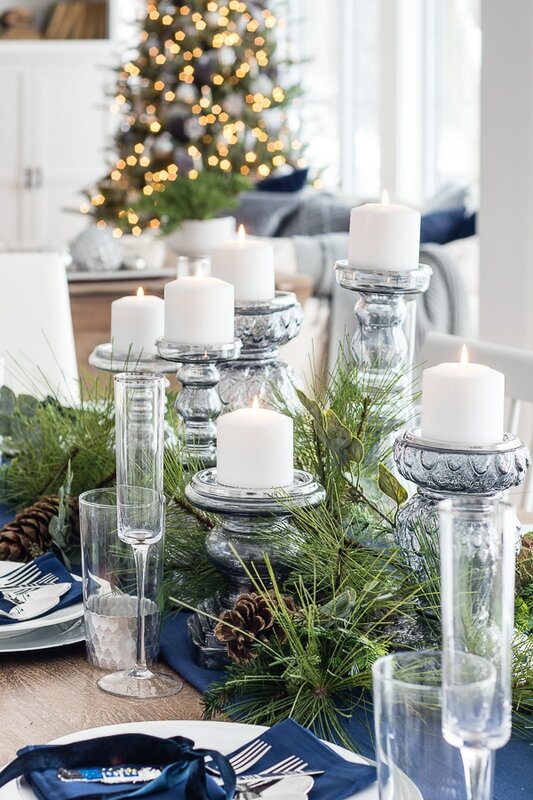 Do these candlesticks have that silver tint or are they clear glass? Thanks so much! These are clear glass but the top is silver so it gives them sort of a silvery sheen reflecting down, they are really pretty in person!